Yesterday was the brew day for Nick’s brew of choice, a SweetWater IPA clone. Nick is our only southerner and also is the only other member of the apartment who enjoys the hoppy beers, so this seems like the perfect choice to represent him in the roommate line-up of brews. No matter how it changes over time, an IPA will serve as a nice counterpoint to the robust stout and what will likely be a malty or light, zippy beer for Jason. I’ve finally learned how to properly conduct a partial mash! The OG was supposed to come out to be between 1.062 and 1.065 depending on my efficiency, and I hit 1.063 after over-diluting by mistake. I mashed as I for forty minutes with 6 quarts of water at about 152 degrees F before heating to about 158 degrees F for the final 20 minutes. 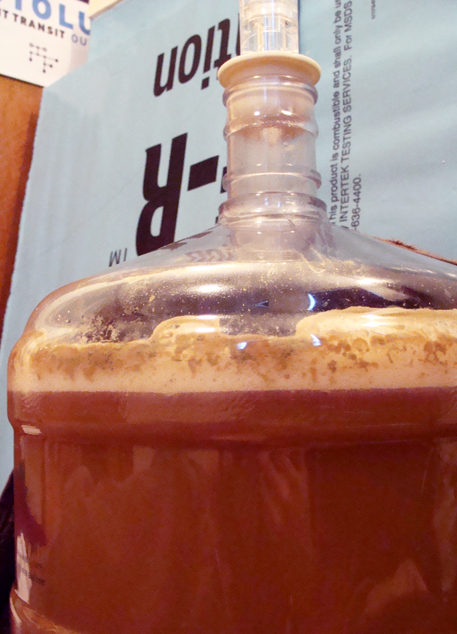 I sparged with 2 gallons at 170 degrees F. I took the yeast I just harvested from my Heavy Seas Gold Ale clone out of the fridge and let it sit for about three hours to warm to room temperature before pitching it all (about 2/3 cup estimating by eye – perhaps an overpitch). My whirlpool failed to do much to aggregate the break matter. I was able to cool the wort in about 40 minutes, attempted a whirlpool again, and let the trub settle for another 20 minutes before racking into the primary. The break matter was still fairly uniformly distributed along the bottom of the kettle after the whirlpool, with only a slight dip near the perimeter. In the future I won’t be bothering with it, although I will continue to siphon the wort down to the trub, and then only use a funnel and screen for the remainder, as this seriously cuts down the time it takes to get the wort into the primary. I topped off the wort to 5 gallons (plus a little extra by accident), which brought it down to about 65 degrees F before the pitch. It ferments! The yeast were hard at work within 9 hours of pitching. Despite the temptation to put my stir plate to use, I decided not to do a starter since the yeast is rather fresh off the cake. I simply made sure to pitch an adequate amount of yeast. What that amount actually may be is hard to estimate, though Mr. Malty and other homebrewers indicate that quarter to a half cup is adequate for a typical gravity (~1.05) beer. I plan to dry hop once I stop seeing airlock activity and leave it in there for a week before bottling. I’ll be using Simcoe pellets since whole hops were not available, and simply put them in a bag with my Teflon stir bar as a weight before dropping it into the fermenter. 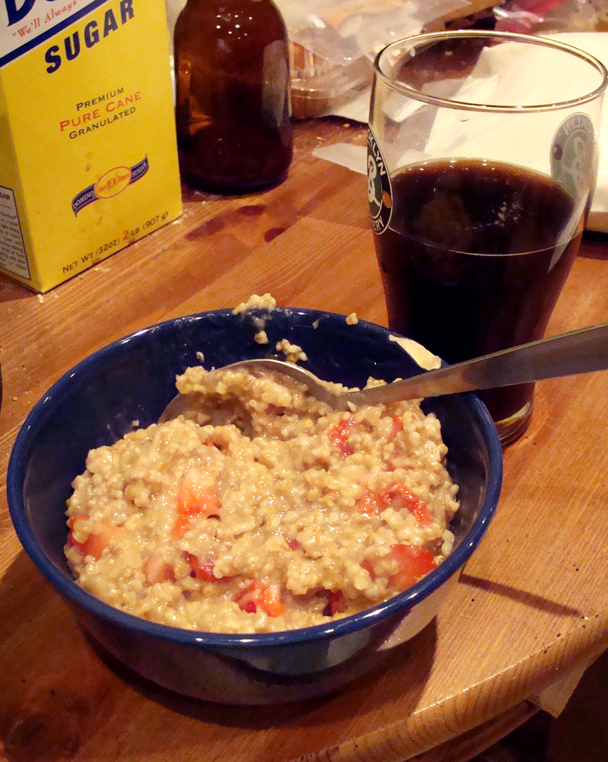 Irish steel cut oats cooked in wort, served with a stout. Unfortunately, things are still looking pretty grim for the coffee stout. As a special treat to myself, I heated up a pint of water and ran it through the grains after I was done sparging. I collected these “second runnings” into a pot, brought it to a boil, and used it to cook some steel cut oatmeal. The sweetness came out in the finished product as delicate rather than saccharine, and the grains also helped along in flavor. I added fresh strawberries for extra punch and nutrition. Alongside I sampled the coffee stout, which I still hope will improve with some conditioning. Currently it tastes quite foul. I again saved the spent grains and dried them out for substantially longer (by several hours) than the last batch. I’m hoping the additional drying will lead to more success in my attempts to make flour out of them. I have several recipes in mind that call for spent grain flour that I am really looking forward to trying out in the event that I’m successful this time. 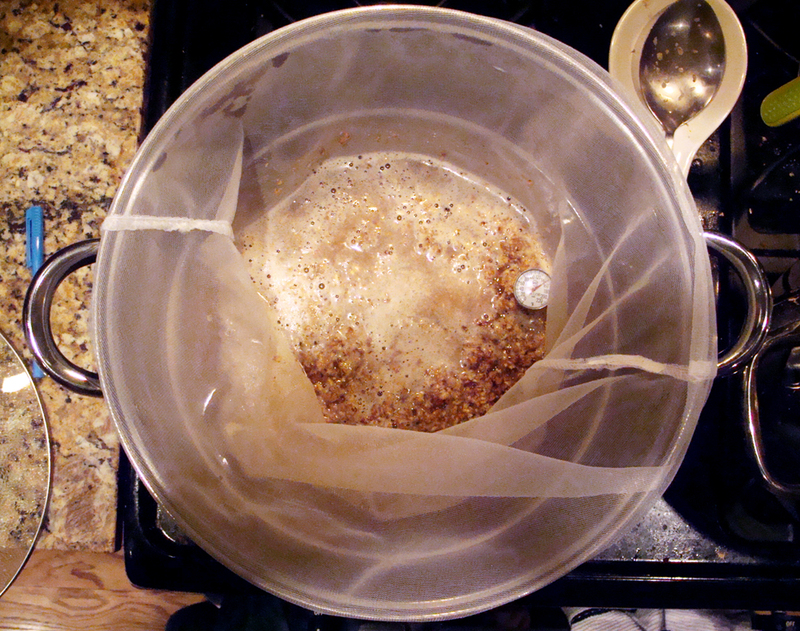 This entry was posted in beer, brew day, learning, recipes and tagged coffee stout, IPA, spent grain, sweetwater, yeast washing on March 27, 2013 by Dylan Bargteil. I am planning to give the coffee stout a few extra weeks, hoping it’ll age out the off-flavors. It seemed to be doing that before the second fermentation during carbonation, but who knows if it’ll ever really get there. Sparging is really just running hot, fresh water through the grain bed. 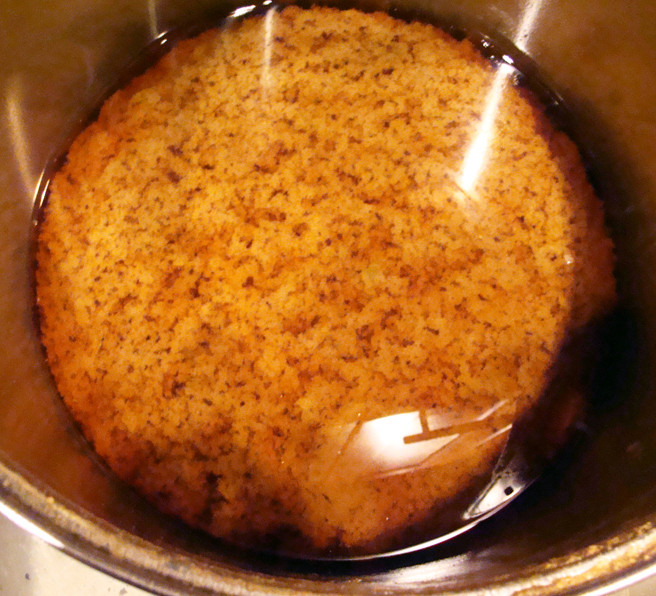 The idea is that when you drain off the mash, much of the sugar stays adhered to the grain. Sparging sort of washes this sugar off of the grain by dissolving it in fresh water (which will have higher solubility for the sugar). Sparging helps you extract the maximum amount of sugar from your grains, increasing your efficiency (amount of sugar vs amount of grain). It is typical that over a gallon of water will be boiled off in all-grain batches, and sometimes two or more gallons, which is what prevents the wort from being watery, but even without boiling off water, I could easily taste the sugar in the runnings I used for my oatmeal. There is another process that precedes sparging in all-grain brewing called vorlaufing, where one drains some of the mash and passes it through the grain bed again as you suggested. This is mostly for clarifying the wort, while sparging is for increased efficiency. There is a lot of literature out there about temperatures, pH, and mineral content in water and how they inform mashing and lautering/sparging techniques. I don’t know too much about these techniques since I only do partial mashes. Since the huge bulk of my sugar comes from extract, I don’t have to be too concerned about my efficiency, because a 20% drop in efficiency only means I lose 2 or 3 points of gravity. Partial mashing and steeping is very easy, and I definitely recommend trying it out if you’ve got the hour (or 20 minutes for steeping) to add to brew day. Thanks for the explanation, that’s kind of how I envisioned it but now it makes a little more sense now. Think I’ll wait on the vorlaufing but maybe I’ll try a batch of partial mash and see what happens.